The greatest artists in history always had something that inspired their work. With this amazing mix of fresh lilies and roses with green fillers in a glass vase, you just found your muse.The greatest artists in history always had something that inspired their work. 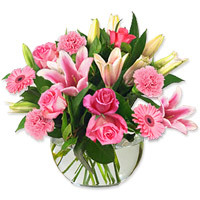 With this amazing mix of fresh lilies and roses with green fillers in a glass vase, you just found your muse.